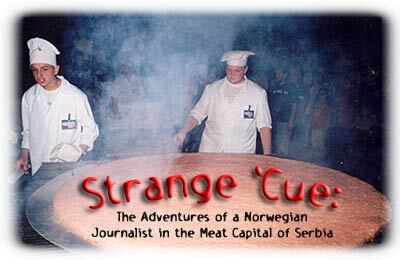 Lost in a fog of barbecue smoke, this skinny Norwegian journalist finally found his way to the biggest barbecue festival in the Balkans. In one week in September, I was exposed to more meat–strange meat–than I have ever seen in my life. Serbia is one of those nations famous for its love of meat, and the little southern city of Leskovac is considered the meat capital of Serbia. I was there to cover their annual barbecue festival and maybe even win a heifer. Usually, 20,000 visitors come to the festival every day. However, this year the organizers were cursed by pouring rain–out of seven days, the weather ruined two of them. 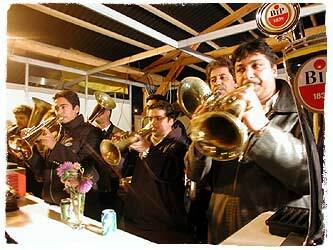 Still, even with the number of visitors reduced, forty-eight BBQ chefs competed to win the palates of the visitors. The people of Leskovac believe that they are world champions in the art of barbecue, even if they define it a bit differently than Americans. Are they right? What do I know? But I do know that they are very proud of their meat and their barbecue traditions. Everyone wanted to feed me to prove that they had the best meat, and I had to eat all the time, if I wanted to or not. I almost started missing my mother’s vegetables, but only almost. I am the first to admit that I’m an amateur in the field of barbecue, but I know when I taste something good. The meat was so tender that it seemed to melt on my tongue. According to the locals, they track their barbecue history hundreds of years back to the people of the Caucasus Mountains. They attribute the current pride of their traditions to the old barbecue master Bure, which means “The Barrel.” Bure’s real name is Dragomir Gligorijevic, but everyone just calls him Bure because of his enormous size. He is a legend that every barbecue master in Serbia looks up to, but sadly now at 84 years of age, he is an invalid because of a stroke. He is not able to communicate very well, and he never gives interviews. However, one man ensured that Bure would not take his secrets to the grave. Grujica Ivkovic, nicknamed Gruja, collected the master’s recipes, and he was willing to share some of them with me. 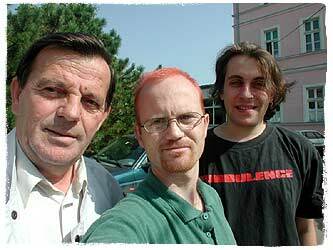 Gruja is the head of the local tourist association in Leskovac. Although not many foreigners come to Leskovac, Gruja wanted to show off some of the secrets of great barbecue in order to entice cooks from all over the world to come to his town and compete. Or, he will travel and teach. 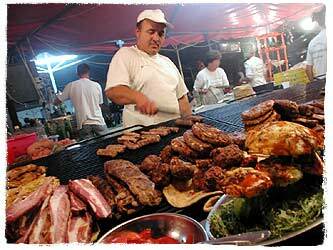 “If someone pays our expenses, we are more than willing to show Americans how we grill our meat in Leskovac,” he said. 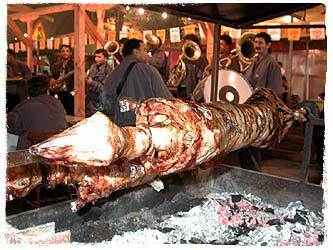 The most important barbecued meat in Serbia is the pljeskavica. “A pljeskavica without onions and hot peppers is not a pljeskavica,” Gruja told me, giving a simple explanation of the difference between a pljeskavica and a hamburger. “You get the best pljeskavica if it is well browned on the outside with a thin layer that is cooked medium in the center,” he added. “I can give you an example,” said Gruja. “If you grill a brain on the barbecue, you need to add fat from the kidneys, and you put the brain in lung tissue.” I was excited that he was sharing such secrets with me. Then he said, “Another specialty is barbecued beef testicles.” Balkan barbecue was starting to get strange, but I pressed on. “I’ll remember that,” I told him, wondering if I would ever slaughter a cow. 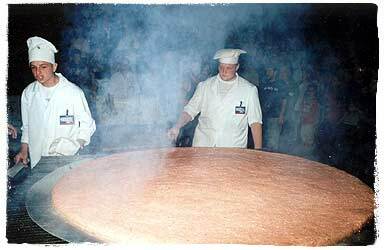 During the festival, there is a contest for preparing the biggest pljeskavica, which the Leskovacians believe is the largest meat patty in the world. But there have been many claims for the world’s biggest hamburger. Seymour, Wisconsin currently holds the world record for producing the largest hamburger after cooking an 8,266 pound burger at Burger Fest on August 4, 2001. When the chefs of Leskovac heard about this, they rejected it, claiming that it is not possible to make such a big hamburger if you do it properly. The size of their properly prepared pljeskavica last year was 53 pounds with a diameter of 56.7 inches. Unfortunately, the heavy rain forced cancellation of this year’s attempt to top the giant pljeskavica record. competition for the largest pljeskavica. “Not nine millimeters?” I asked. “No, only eight,” he insisted, not understanding my sense of humor. The organizers of the festival usually hold a competition for eating hot peppers, but this year they said that they didn’t want to risk the health of the competitors. Last year’s winner ate 22 in one minute, and his prize was to have the privilege of judging the pljeskavicas. In addition to making big pljeskavicas, there are also competitions for making the best meals, and the chefs compete in four different categories: Pljeskavica, Vesalica (pork steak), Muchklica (mixed meat), and Innovation (something creative and new). The winner of the most prizes above is crowned the overall winner. In a world dominated by men, this year’s overall champion was Bojana Mirkovic, a woman with 20 years of experience in the barbecue trade. Bojana is confident in her own abilities, but humble when she compares herself to Bure. and here she poses with her trophy. “He is a legend,” she told me. “He prepared meat for Tito [the lateYugoslavian president], Gandhi, the English queen, and John F. Kennedy. Bure didn’t have a mincer, and he cut all the meat by hand. He was the one who invented barbecue.” I did not have the heart to inquire how Bure persuaded Gandhi, a very famous vegetarian, to eat his pljeskavica. However, even if Bojana respects the old master, she has the self-confidence worthy of an American. As the overall winner and several prizes in the festival in past years, she has reasons for her confidence. “In the beginning it was exciting for me to win,” she said, “but now I’m used to it. I’ll beat any American any time. 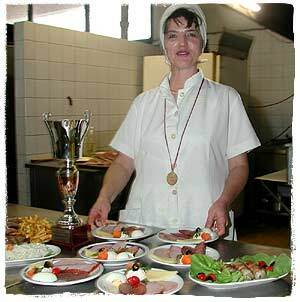 You can come to Leskovac to compete, and I would also like to compete in America.” Again, I didn’t have the heart to tell her that beef testicles were not part of the competition at Memphis in May or the American Royal. Restaurant owners come to Leskovac from all over Serbia and some from the neighboring country, Macedonia, to the south to set up stands to compete and also sell their meat to the huge crowds. The Perper restaurant from the Serbian capital, Belgrade, 160 miles north was also present with the biggest stand. They were offering prizes for visitors who would vote for them as the best restaurant. Together with my partner, Paris, we ate pljeskavicas at Perper, hoping to win the second prize, the heifer. The first prize was a Serbian car, but since I already have a car, I was much more interested in the heifer. I have never killed a big animal like a heifer before, and I dreamed about how I would slaughter it with my 9 mm slaughter gun. After letting it rest for awhile, of course. Well, among thousands of ballots, mine was not chosen, unfortunately. In any case, the locals rejected the contest as a marketing ploy. “We don’t need these kind of prizes; we have the best pljeskavica,” said Sanja Zdravkovic, the marketing director of Mesokombinat, the largest meat wholesaler in the area, which also has a restaurant in Leskovac. Now they just wait for American barbecue chefs to visit them next year. Be sure and bring your brains. Here is the famous Serbian “hamburger,” as prepared by the master barbecuer Bure (The Barrel). Note: This recipe requires advance preparation. In a bowl, mix together all the ingredients with your bare hands. Cover and let the prepared meat to “take a sleep” during the night in the fridge. Before grilling make a ball of meat in hands and plop it in hamburger-like form. Grill immediately over hot coals. Serve on a plate with pickled condiments. Bure calls this “mixed meat to save your marriage.” Perhaps that phrase is the result of the testicles. After butchering the animal, separate and clean the testicles (also known as “white kidneys” in this part of the world). Remove the membrane. Parboil them for few minutes (stop when the water starts to boil briskly). Salt to taste and grill until they become red. Dice the balls and place in the pan with other meat. 2 ounces (1/4 cup) chopped onion. Grill all of the meat on barbecue. Place the onion in dry pan and put it on the barbecue to get warm. Add the chile powder and mix well. After the meat is grilled, dice it into small pieces and put it in the pan. Add the salt. Mix well, cover, and heat through. Serve it on warm plates. This recipe is from meat mistress Bojana Mirkovic, overall champion at the Leskovac Barbecue Festival. This was one of her winning meals. Lambrequin is lamb peritoneum, or stomach lining, used to wrap steak, pljeskavica, or liver before grilling it. It gives the meat an extraordinary flavor. Ask your butcher for it and hope that he doesn’t laugh at you! Pound each steak until thin. Add pepper, salt, and garlic to the pounded. Cut the bacon and cheese into narrow strips and place them on the meat. Sprinkle the mushroom over the meat. Fold up each piece of meat and wrap it in the lambrequin. Grill the meat over a hot flame for about 5 minutes per side. Serve on warm plates.